Finally a B&O mobile phone that was not just a clone of another considerably cheaper model. This model was the result of collaboration with South Korean electronics giant Samsung who were responsible for the hardware while B&O supplied the design and also the appearance of the operating system. Text copyright © Beocentral. Unauthorised reproduction prohibited. A clamshell phone but with a motorised opening system, the Serene was a plastic device but with a very tactile soft touch coating. 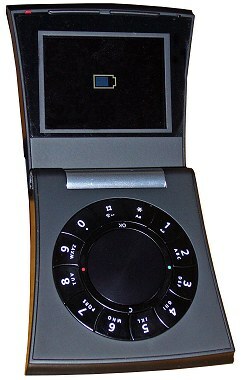 The phone opened as soon as any pressure to open it was applied and this displayed the unique selling feature: it was designed with the keypad at the top. This was in the form of a circular dial with a jog wheel similar to that seen in the Beocom 6000, the screen was at the bottom. The advantage of this was said to be the reduction of grease stains on the screen but was far more to make the phone appear different from all others. The keypad was operated using one’s thumb and was extremely intuitive to use, allowing rapid text writing using the predictive T9 text system. Text copyright © Beocentral. Unauthorised reproduction prohibited. The operating system was easy to navigate though users would soon notice the lack of an ability to alter the appearance. The phone’s rarity also ensured that setting up web browsing was not easy, as most companies did not list the Serene though this was remedied later – the phone is listed as a Samsung SGH-E910. Text copyright © Beocentral. Unauthorised reproduction prohibited. Included in the box was a docking station, which boasted another B&O innovation – synchronisation of the address book with the owner’s DECT B&O phones. This worked extremely well though one source of disappointment was that the Serene did not act as a DECT handset in the home. Text copyright © Beocentral. Unauthorised reproduction prohibited. Using the phone was extremely simple when using it as B&O had clearly intended – as a simple phone. It did however have certain foibles when the more complex features were used: the camera, a surprisingly low specification 0.3Mp device, was positioned on the side of the phone which made it extremely difficult to take a straight picture. The ring tones, although interesting with a variety of natural materials being struck, could not be customised – though admittedly the thoughts of certain amphibious performers appearing on a B&O product had possibly been too much for the designers to stomach! Unfortunately, early models were plagued with software and hardware failings which would have been annoying on a free with contract Motorola but completely unacceptable in an �£800 mobile phone. This was a huge shame and clearly not expected as the turnaround repair time of phones was lengthy and no replacement phone was issued initially. Text copyright © Beocentral. Unauthorised reproduction prohibited. As the software problems were sorted and the hardware issues dealt with, the phone became an interesting if still extremely expensive style symbol. However the market is very fast moving and unfortunately it is possible that the original problems could well mean that the Serene will not be as successful as it first promised to be. Text copyright © Beocentral. Unauthorised reproduction prohibited.